Shayne's new book is out now! One freezing July night, the cold, hard, truth hit author Shayne Hammond like a freight train: no one was coming to his rescue. It was then that he realized that he already had the power to change his life. All it took to turn his life around was a little faith in himself. And on one fateful, frigid night, the epiphany he prayed for happened. In that moment of clarity, he understood the mystery of his successes and his failures. He thinks they may be the answers to your mysteries as well. 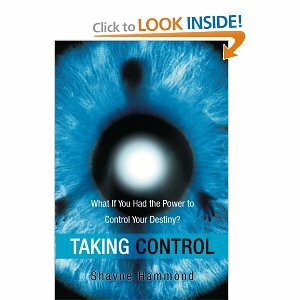 Are you ready to take control of your destiny too? ARE YOU TIRED OF LOSING ? Are you tired of not being smart enough, not talented enough,not good enough to achieve your dreams.Personally, I see the history of the world, as a history of oppression. Since the beginning of time man has oppressed or been oppressed: by circumstances and others. I believe this was a major key of Jesus' teachings; that you can rise above your oppressor, and live a life full of outstanding achievement. THERE IS A MIGHTY POWER WITHIN YOU !! I believe this power controls the world, and I believe it exists for the benefit of mankind. I truly believe it’s the answer to every obstacle we face. This power, if used consciously, will cause each of us to rise above the oppressor and begin to conquer. With this in mind, we created this site as a source of encouragement, filled with practial steps you can take to learn how to unlock this power that is within every person, and improve every area of your life. To learn more about Shayne, you can download his monthly meetings at no charge. Listen Online. Click here to contact Shayne. Be encouraged by testimonies of people who've transformed their lives. From overcoming depression to destroying cancer, click here for more information.